Turids! I know the first section is a bit of a doozy, but I was on a roll dammit! Since time immemorial, an endless cycle has been repeating itself in the untamed wilds of the galaxy. On a lonely planet somewhere out in space, a shooting star cuts across the sky. It strikes the planet and bursts in the impact. But from its ruins, a single creature emerges. Dragging the bloody remains of the pod which has carried her so far, she burrows into the earth, her claws easily tearing through the impact-hardened ground. Deep under the earth, she digs out a small chamber, piles the ruined flesh of her conveyance in a corner, and begins to lay eggs. From these eggs emerge hundreds of smaller, but similar, creatures who begin the process of digging out new rooms and tunnels in their underground complex. At first, the fungal organisms they are able to cultivate on the ruins of their queen’s stellar conveyance sustain the colony, but soon they are forced to breach the surface in search of food. The workers trickle forth, hauling biomass back to their hive to feed the fungi which sustain them. Slowly but surely, the colony grows, until the planet is nearly overrun with the creatures. Under the light of the sun, they cultivate great fields of plant life upon which to feed. Once the population reaches a critical mass, a group of queens gather in a single chamber under the planet’s surface. Above them, a legion of workers construct a great spire, higher than any mountain, stretching into the upper reaches of the atmosphere. The queens grow and warp, their flesh lining the insides of the spire. Time passes. And then the tower rumbles to life, launching new pods into the depths of space, laden with new queens on their own thousand-year journeys. Thus it has been since the Architects left this world. The epitaph is not accidental; on a species-level, the Turids act much like a Turing Machine, spawning specific bioforms in response to a variety of circumstances. Until recently, the system had remained relatively unchanged for millennia, but their encounters with Humanity and the Colserans has jump-started a new wave of rapid evolution in the Turids, as they adapt themselves to a world shaped by the actions of interstellar civilizations. Perhaps the most drastic adaptation has been the co-opting of jumpships to expedite the interstellar transit of Turid Queens; entire new castes of Turid have evolved to sneak eggs aboard jumpships through either stealth or crude mimicry of the human form. Luckily for their 'foes', the evolution of biological jumpships appears to be outside the realm of possibility for the Turids. Much more likely, however, is the possibility of the evolution of a 'pilot' caste capable of operating stolen jumpships. The consequences of such a development are too terrifying to imagine. The other major change in the Turid's patterns has been an increased focus and proficiency in making war. Sophonts resist Turid colonies in a way that no mere wildlife can, and the sophisticated technology of these interstellar civilizations makes their resistance more potent than most. The Turids fight like they live: tremendously well-coordinated despite, or perhaps because of, a lack of leaders. 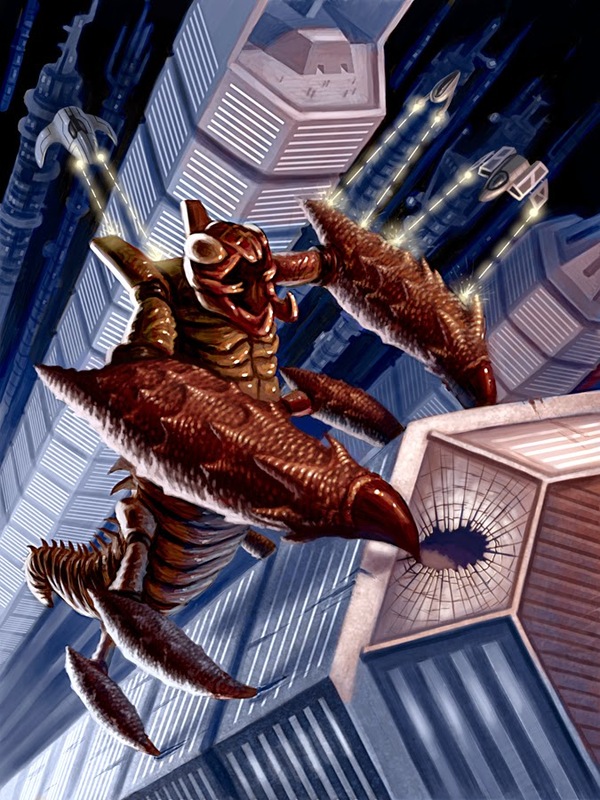 Smaller, weaker Turids swarm over their enemies and cut them down with their claws and bizarre bio-weapons, while larger creatures slam into fortified positions with the force of a bomb. The Turid's weapons are unlike any ever seen in the galaxy before, ranging from biological crossbows hurtling bolts of reinforced bone to swarms of radio-controlled venomous insects and great bloated monstrosities vomiting torrents of acid. Each of these individual creatures acts with coordination far greater than their bestial appearance would imply, acting as a cog in a great instinctual war machine. Turid intelligence works in a way much like a botnet or an ant colony; while a single Turid is effectively mindless, in groups their processing power is pooled to form a greater whole. In a real and functional sense, all the Turids on a world can be thought of as a single 'superorganism'. When viewed as such, the true nature of the Turids becomes clear--they are simple subsidence farmers, arriving on a world, transforming it to feed themselves, and then sending their children out into the wilder cosmos in hopes that they find their own lands to farm. While many believe these superorganisms to possess some form of intelligence, no attempts to communicate with them have been fruitful, though the Colserans continue to try.